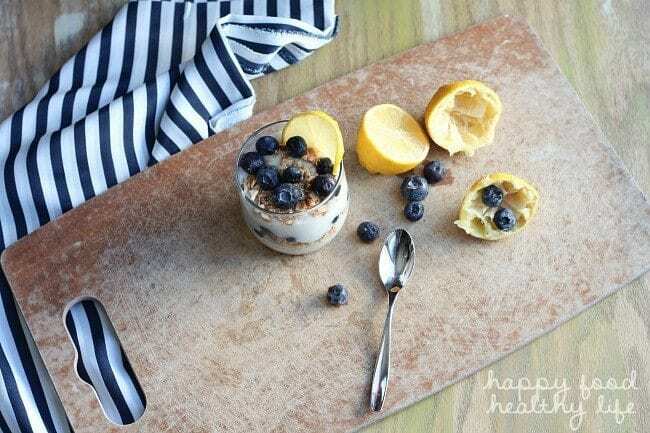 This lightened-up COCONUT LEMON PUDDING PARFAIT brings a boost of sunshine to your tastebuds in each bite. I hope everyone had a wonderful Valentine’s Day, however you decided to spend it. Mine was so wonderful, and it started with the sweetest little surprise from my 8-year-old tender-hearted boy. He came into my bedroom around 8:30 telling me to get up so I could see the gift he made for me. He was insistent that it took him such a long time so I’ve got to come and see it. When I went downstairs to the kitchen, I couldn’t believe my eyes. The thought that went into this sweet Valentine’s breakfast from my little boy. And he did it all on his own. No help from any adults. It was all his own idea and doing. I don’t know how I got so lucky to be his mama but I’m so grateful that I did. And my sweet wife. We said we weren’t celebrating Valentine’s Day until today since we both have the day off work and the kiddo goes to his dad’s. But of course, she had to bring home a gorgeous bouquet of roses. I’m just not sure how I got the long end of the stick with these two, but they sure know how to bring so much sunshine into my life day after day. 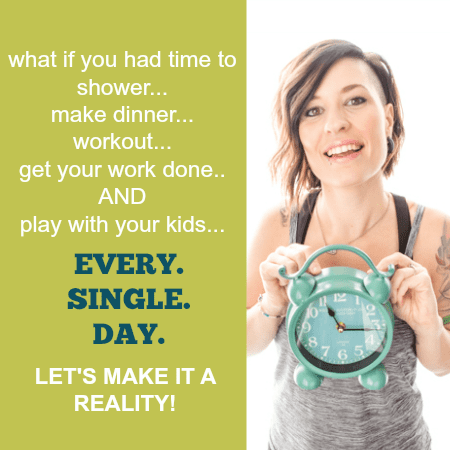 And speaking of sunshine, we have had so much abnormally warm and sunshine-y weather here in Utah, and I am so ready to bring on the springy recipes. All.The.Lemons! 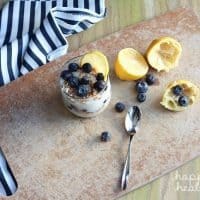 So while my family brings all the sunshine into my life, I do my best to whip up the sunshine in the kitchen, and that’s exactly what I did with this lemon pudding parfait. This pudding is so light and airy, and full of that punch of lemon that we all love. And layered with fresh berries and a crunch of almonds – yeah, it’s pretty perfect. And this isn’t just any pudding. I used my favorite Coconutmilk in order to make it lighter, and if you want to go completely dairy-free, feel free to use a vegan butter/margarine such as Melt or Earth Balance. So let’s kick of the spring season a bit early with these little cups of sunshine to wake up the tastebuds. Whisk together sugar, cornstarch, and salt in a saucepan. Slowly whisk in coconutmilk and bring to a boil over medium heat, whisking constantly. Lower heat and simmer, whisking until mixture thickens, 3-4 minutes. Remove from heat and whisk in butter (or dairy-free alternative) and lemon extract. Cool at least to room temperature in a bowl before placing in the refrigerator for a couple of hours to set. Once the pudding has been cooled, spoon a small amount into the bottom of a small cup. Top with crushed almonds and blueberries. Layer with a couple more spoonfuls of pudding, almonds, and blueberries. 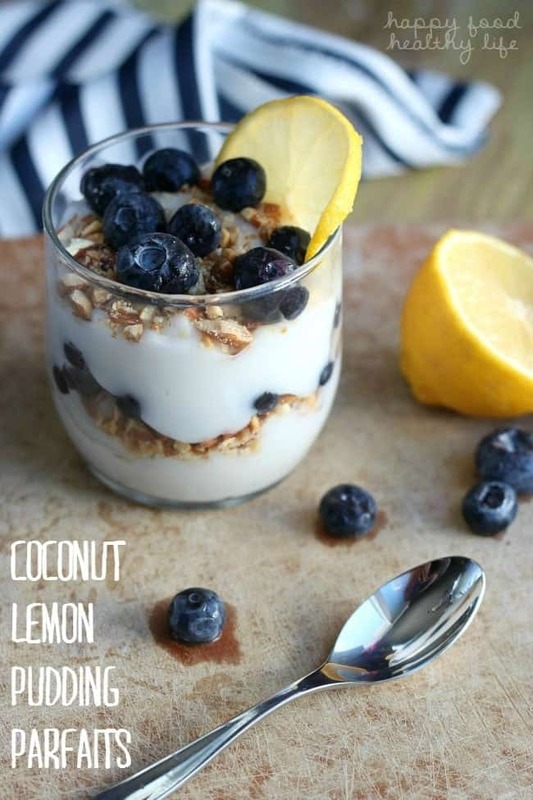 Looking for more Lemon Desserts? It looks yummy! But I have a question. Your picture shows lemons that have been squeezed but I don’t see lemon juice in your ingredients or directions. Could you clarify that, please? Is it possible to do it with fresh squeezed lemon juice instead of the extract? Thanks a lot. By the way, I love your blog! I had the same fruity coconut instinct this week, only I used raspberries, and mine isn’t quite as healthy as yours! …what a nice breath of spring for this dreary month!